2+ Cups additional crisp topping for the tops of the ramekins; recipe follows. 6 ounces unsalted butter, cubed and chilled. Place flour, sugar, and cracker crumbs in large bowl and combine. Work the butter into the dry ingredients with your hands until it is crumbly. Store in the refrigerator for up to a week and use as toppings for cobblers, crisps, or grunts. Place the diced apples and blueberries into a mixing bowl and add in the sugar, cornstarch, and 1/2 cup of the crisp topping. Stir to combine. Divide the fruit mixture evenly between six (6) 4.5 oz. ramekins. 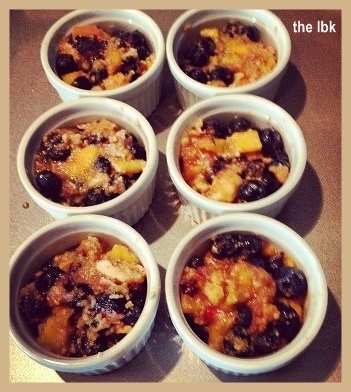 Divide the remaining crisp topping and top each ramekin with crisp topping. Place the ramekins onto a baking sheet and bake on the middle rack for 30-35 minutes or until they are bubbling and the topping is golden brown. Does this recipe look a little bit familiar? Maybe a tiny bit? It's ridiculous close to this one I posted awhile back!